Randi Obenauer’s ranch in Powell River, British Columbia, is straight out of a movie. 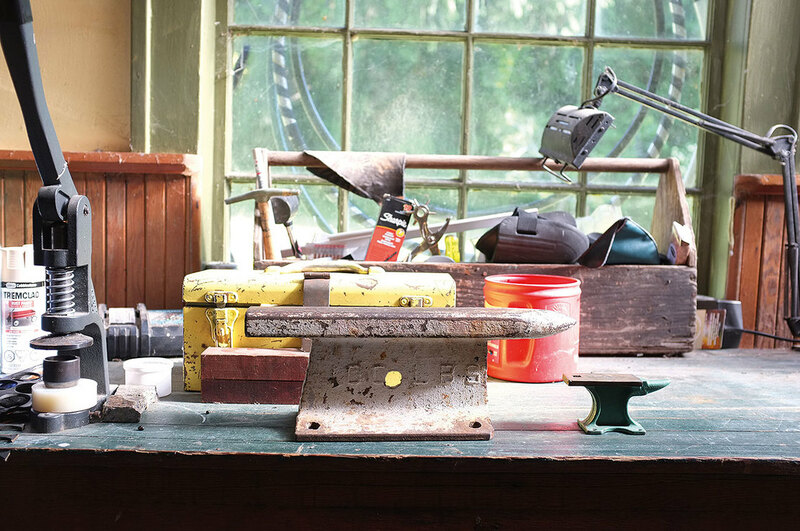 The walls of the house and leather-working studio are covered in motorcycle art and leather. 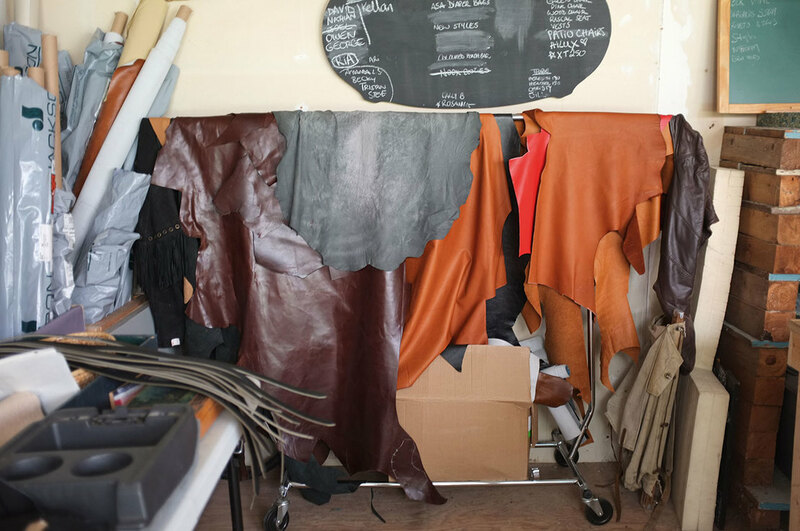 There’s a fire burning in Randi’s workshop, and she’s got stacks of seats, seat pans, leather bags and every colour and type of leather you can imagine. Randi used to park her motorcycle outside of my friend’s building every day. I was just getting into bikes, and I watched her come and go for months before finally approaching her. What stood out was her gold tooth, her long mermaid hair that trailed her while she rode and her infectious, one-of-a-kind laugh. We became instant friends, and when I bought my first bike, Randi offered to fix up the sun-stained, thrashed-up seat. She made me a seat worth more than the bike itself. I will continue to have Randi make every seat for every bike I buy until I run out of money, or run out of bikes. I bought a 1997 Harley® Sportster® chopper last summer with a cool King-Queen leather seat. When I rolled into Randi’s ranch to chat with her for this story, she said, “I made that seat!” Turns out, she thinks it’s one of the best King-Queen seats she’s ever made. “I’m so thrilled that it’s out there on miles and miles of rad adventures with you,” she said. How long have you been making motorcycle seats? I’ve been doing upholstery for 14 years. I did three Honda seats in 2005, and then 50 Harley sissy bar backrests for a local shop. I really started honing in on motorcycle seats in 2010 through my brand Aro Custom Upholstery. I was one of the last graduates of the Kwantlen College certificate program in automotive industrial upholstery and trim. I was one of four females that year, the most ever. 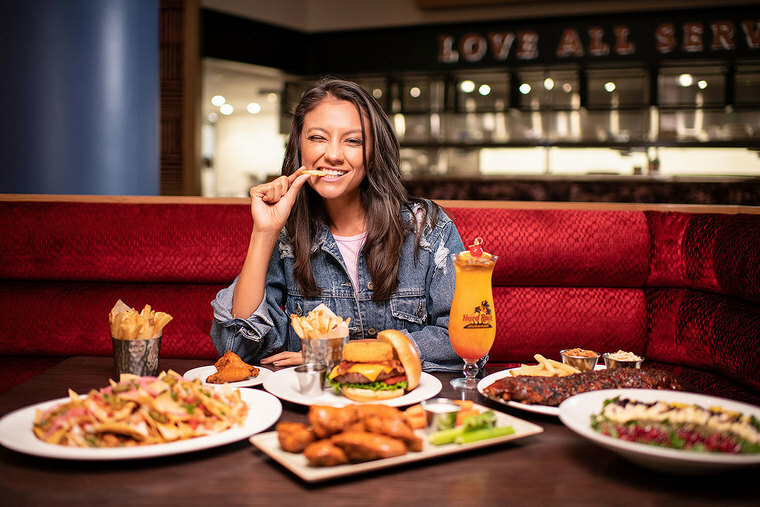 It was intimidating at first, and I dealt with sexism at school and in my first years in the industry, but it was also empowering as I found my voice and became confident in my hard-earned skills. More than one employer told me they were surprised by what I could do. 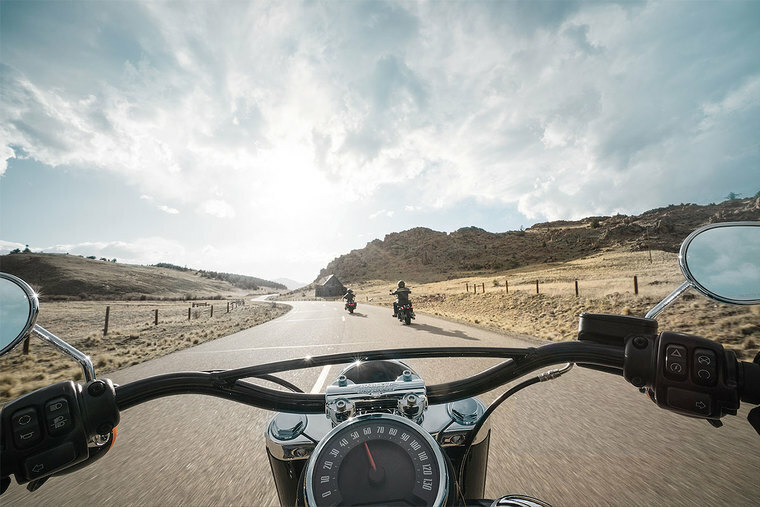 Tell us about some of your favourite Harley-Davidson® seats. 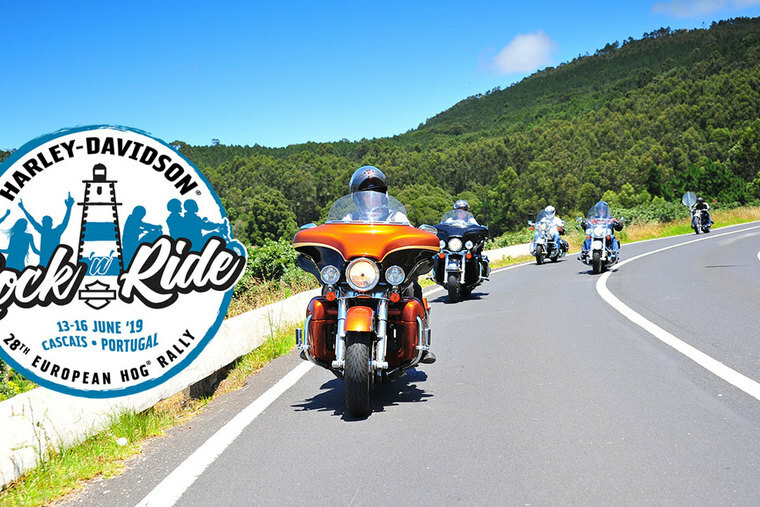 The Williamson brothers brought me into the chopper scene in Vancouver, referring friends to me for Harley-Davidson Ironheads, Shovelheads, Sportster® models – so many Harley choppers. Owen’s seat for his Ironhead, The Ghetto Sled, will always be one of my favourites. He chose a brown leather with diamond stitch, and he keeps rubbing used motor oil into the leather when he does oil changes. It’s crazy beautiful and totally celebrates the beautiful potential of leather as a natural material. Some of my favourite seats have been creative designs on Sportster saddles for rad women riders. The black leather seat with multi-coloured geometric stitch patterns for Diana from Kelowna, B.C., is one of those. I did a black leather Harley seat for tattooer Alex Snelgrove with green diamond stitch and a yin-yang symbol. 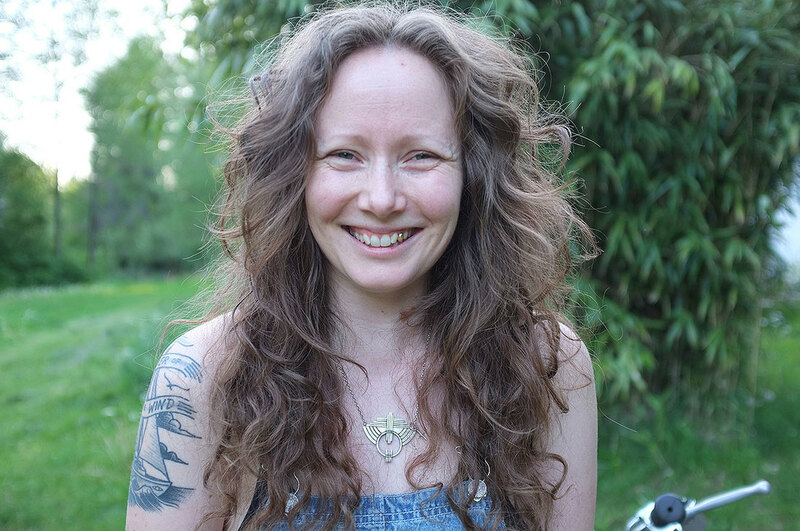 Tori Drew’s tiny Queen seat that keeps evolving with her little chopper rules as well. I just finished a Sportster seat for a gal in New Hampshire who wanted a heart stitched on the rear panel so her mama would always be with her on the road. Andrew McKay has my favourite leather bagger seat. He brought me a rich mustard distressed leather, somehow exactly enough to do his whole giant seat with barely any scraps left over. It’s now worn into a faded gold and looks amazing on his black Road Glide® model. What’s the story behind your amazing studio? The first time I visited Powell River, I knew I had to move here. Three years ago, my partner, Sean, and I bought our dream home here, on an acre bordered by a creek that runs right beside the house. The original structure is over 100 years old. My son, Hawk, was born here, at home, two years ago, and I’m so stoked that he gets to grow up with this amazing paradise of nature and adventure right out the back door. I have the raddest uncle ever – he’s been the biggest motorcycle influence in my life. He would take me and my siblings for rides whenever he came to visit when we were growing up. I know my mom rode a bit when she was young but she won’t talk much about her wild days – I have to get all the good stories from my uncle. I was really into horseback riding growing up – “the original dirt bike” Sean says. I escaped to the big city for college, and once I got into upholstery I quickly fell in love with motorcycle seats. After a couple years of doing seats for everyone else, I finally got my licence based on the sage wisdom of my life coach, Jangus. Within a week, I owned my first bike, and I put 3,000 kilometres on it that first summer. Six years later and I’m riding less these days due to mom life and all of my upholstery clients, but I still get out whenever I can. What else do you do besides make seats? I’ve been sewing since I was about 10 years old. Besides art school and auto upholstery, I’ve also studied fashion design and textile arts. It’s all interrelated. It all comes down to the things I love doing most: pattern-making, sewing, sculpture and working with leather. After trade school, I took all my upholstery skills and some scrap leather and made two bags for my sister and myself while I was a fashion student, and it just snowballed from there with more and more bag requests. I think what sets my bags apart from other brands is that they are made from upholsteryweight leather and constructed using upholstery techniques and hardware. I founded Ora Leather Goods in 2006 and later mirrored the name when I started honing in on motorcycle seats and Aro took off too! I also love shooting film and hiking with my crew, the Goth Moms Nature Bathing Club. I’m also a doula, a fermentation enthusiast and a baker. I don’t really know how to just stop and do nothing. 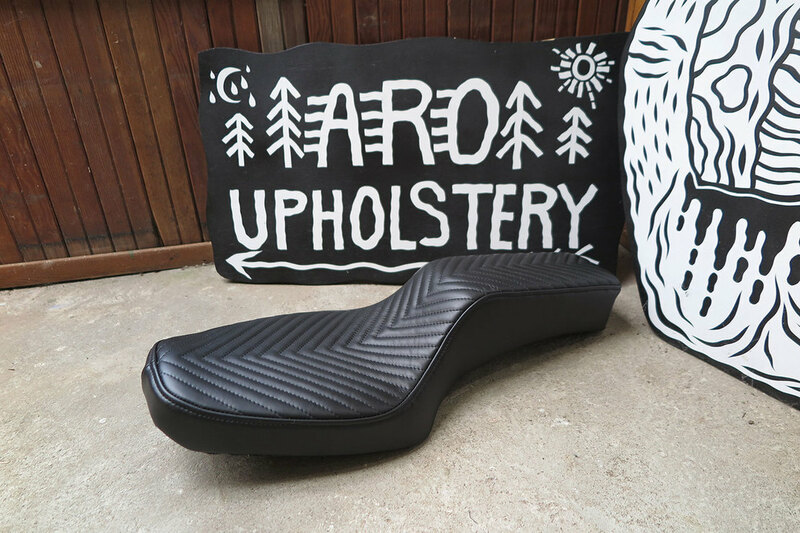 Learn more at aro-upholstery.com or follow Randi on instagram: @aro-upholstery.